Saint-Gobain Performance Plastics' new PharmaSmooth™ flexible hose solves a long-standing problem associated with cleaning the rough surface of any hose covered with EPDM rubber. PharmaSmooth’s EPDM outer surface achieves close to a 20 Ra rating, enabling you to quickly and easily remove dirt on the hose cover with a wet cloth and enhancing the overall cleanliness of your operation. The Chemfluor® FEP fluoropolymer liner used in PharmaSmooth™ has been the top choice in the process industry for many years. The high purity, ultra-smooth inner bore surface of the hose prevents virtually all material entrapment and bacteria build-up, meeting the stringent sanitary standards required in critical processing applications such as pharmaceutical, bio-pharmaceutical, food and beverage production. 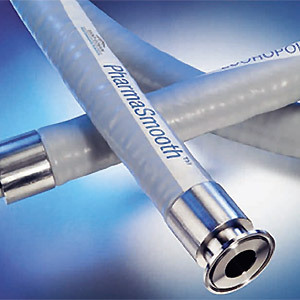 Chemfluor®'s superb chemical resistance minimizes the corrosive effects of transferred media, enabling PharmaSmooth™ to deliver exceptional flow rates over the life of the hose. PharmaSmooth™ and Chemfluor® are trademarks of Saint-Gobain Performance Plastics.